Utilizing herbs for allergies can be an effective way to lessen and to treat allergic symptoms. Different herbs have different ways of supporting our bodies to help us deal with allergies. Some help our bodies cleanse the blood which helps reduce inflammation. Others help us calm down, helping us reduce stress. Here are some of the best herbs for allergies I am familiar with, all of which I have used myself. Given below are their common and scientific names and their typical effects. 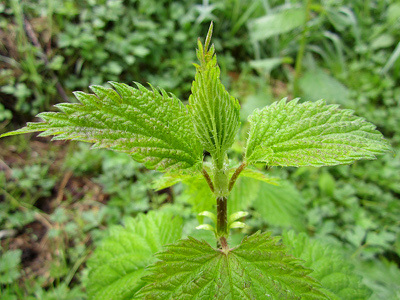 Stinging Nettle (Urtica Dioica): This stinging weed is a truly amazing plant, which can provide for a wealth of survival needs. These plants can specifically help wastes out of the blood, which makes them helpful for allergic symptoms such as eczema. This plant is best used for this purpose by making it into a strong infusion. I often let it infuse overnight. This is one of my favorite herbs for allergies. Oxeye-Daisy (Chrysanthemum leucanthemum): This common weedy flower is familiar to most, with its brilliant white petals and yellow centers. Drunk as a tea or infusion (strong tea), oxeye daisy helps gently calm and dry out runny mucous membranes such as watery eyes and runny noses, which themselves are common symptoms of hay fever. Pearly Everlasting (Anaphalis margaritacea): This lovely papery-flowered plant acts as a gentle anti-histamine and anti-inflammatory. It is best used for this purpose as a tea. Licorice Fern (Polypodium glycyrrhiza): This lovely, simple tree-dwelling fern is a common sight on the sides of mossy maples in the Pacific Northwest. This plant is a helpful aid in reducing inflammation and helps calm longer lasting histamine responses. The rhizomes must first be dried and cleaned, then made into a strong decoction. Here are some additionally beneficial herbs that can help the body heal more quickly. 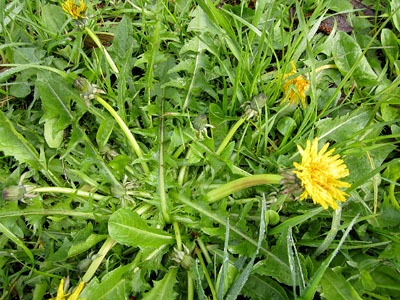 Dandelion (Taraxacum officinale): This common weed is an amazing medicinal plant. I have found it most helpful as an aid in times of allergic flare ups in the form of an addition to a salads. The young leaves are best, and are very rich in vitamins A, C, E and B as well. Having a vitamin-rich diet can help a body recover more quickly from an allergic response. Pineapple Weed (Matricaria discoidea): This weedy species is common around many homes and gardens in urban areas. As a mild flower tea or flower infusion, this plant can have a generally calming effect that can help settle a hyper-sensitive state that is common during allergic responses, especially those such as hay fever. Please talk to your doctor or naturopath before trying these mild herbs for allergies. Everyone has a different body, with different needs and some people may have an allergy to one or more of these plants. Although they have healing potential, please approach them with care and respect. 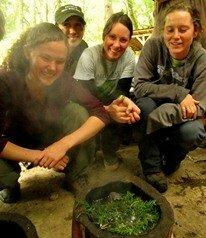 Here is another article about useful herbs from Mother Earth News.